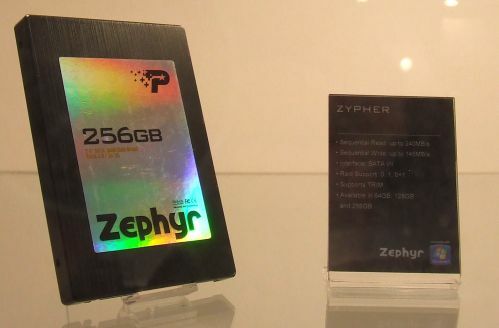 Patriot has launched its newest Zephyr SSD, based on the JMF612, latest generation controller from JMicron, The new Zephyr will be available in 64, 128 and 256GB capacities and promises aggressive pricing with decent performance. In the wake of quite popular Sandforce controller it is quite strange that Patriot went for JMicron one, but according to Patriot, the Zephry series should provide decent performance with quite aggressive pricing and sounds like a logical solution. The Zephyr SSDs will pack 64MB of DDR2 cache and will include native support for the TRIM command in Windows 7 OS. The maximum read speed for all drives is set at 240MB/s while the write speed depends on the capacity so 64GB version will have a maximum write speed of 85MB/s, 128GB version at 145MB/s and 256GB version at 180MB/s. All three drives will have three years of warranty. Unfortunately, Patriot didn't announce the availability date or the price of the new Zephyr SSDs.